It’s hard to imagine how the Hydraulic Reference was received when launched back in the early nineteen sixties. Unlike all other high end turntables of the day, it went against the established orthodoxy in almost every way. The brainchild of David Gammon, the deck first surfaced in 1963 and went into full time production from a small facility in the Holloway Road, north London in ’64, and then from a factory in Borehamwood, Hertfordshire, the following year. It’s a totally original piece of mechanical engineering. 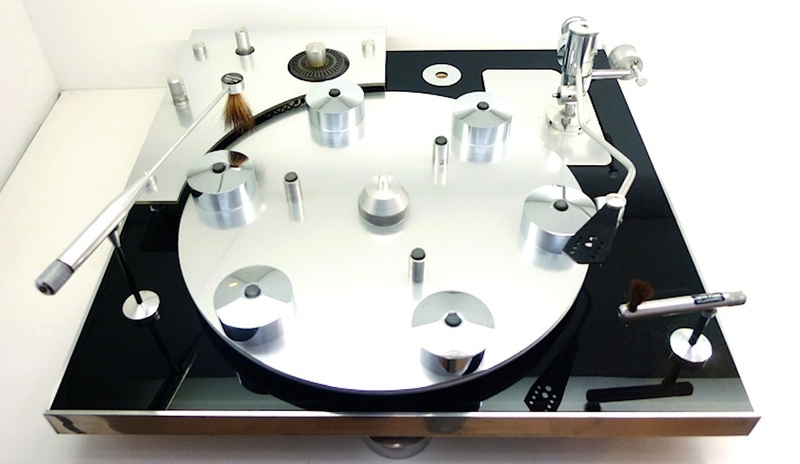 Rather than sporting a sprung subchassis inside a wooden plinth – the blueprint set by decks such as the original AR turntable and the Thorens TD150 – the Transcriptors had a 20mm Perspex baseplate (with the option of an aluminium frame) that sat on three sprung isolating feet. Into this was set the bearing assembly, using a slim section ball-ended ground and polished steel spindle running onto a hardened steel thrust pad and into PTFE bushes going onto a ceramic ball bearing. The motor sub-assembly was decoupled from the baseplate by springs and rubber grommets to minimise noise transfer. The platter was striking – an aluminium disc with six gold-plated brass weights protruding upwards to support the record. Radical enough, but around the main bearing was a circular bath of gel-like silicon fluid. A paddle was affixed to a small lift/lower device; in the lower position the paddle began to excerpt drag through the fluid, which has the effect of lowering the speed by up to 2%. Effectively then, this was a mechanical speed control, rather than an electronic one. There was a small neon-illuminated strobe in the speed control module, rather than being etched into the platter as was the norm. The deck was switched on and off by a slick-acting mercury switch nearby, with the choice of 33.33 or 45RPM via a sprung button. It’s a neat bit of engineering, and once again defines the deck as being very different to its contemporaries, almost all of which showed far less thought in their design. The most famous facet of the Hydraulic Reference is of course the Stanley Kubrick connection; the deck found itself appearing in his masterpiece A Clockwork Orange realised in 1971, and the deck also received a London Design Centre Award that same year. In 1973 Transcriptors moved to Carlow, Ireland, and David Gammon licensed his deck to J A Michell Engineering Ltd., which had been making a number of turntable parts for Transcriptors; the factory was next door. The deck was available with a range of accessories, from a horse-hair sweep record cleaning and stylus brush to a unipivot tonearm. Most Reference Hydraulics were supplied with SME cut-outs however, and with a 3009S2 the deck gives a surprisingly modern sound. It is fast, propulsive and punchy with lots of energy and attack. One striking thing is the excellent sound staging, with a very strong central image and the sense of instruments in the mix being locked in space. Tonally it’s a little brighter than its contemporaries, and its bass is lighter but tauter too. One popular mod back in the day was the fitment of a glass platter mat, such as the GA Audio SoundDisc; this smoothed the sound down slightly by alleviating the biggest problem with the design, namely the insecure fit between the LP record and the platter. A record clamp helped here, too. The other issue with the deck was speed instability; it was perfectly adequate in the early seventies but the later generation of direct drive turntables do better here. Again, a massy platter mat helps here, as does a new belt and a general clean of its contact path. Finally, the hydraulic fluid is best renewed, if it hasn’t been it will have congealed into goo by now. Properly fettled, the Transcriptors Hydraulic Reference is a fine sounding deck that looks the piece of modern art that it is. Prices have soared recently; twenty years ago you could pick one up for £100 or less, now you can add an extra zero onto that. If you do pay full price for one though, make sure it is working perfectly and holds its speed correctly, otherwise you’ll find you use it merely as a beautiful adornment to your bijou modernist living space!